Gege Crochet: Win Win Win! Today was a great day. 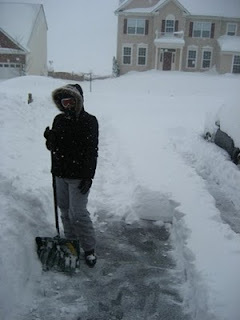 We've been snowed in for quite a while now due to the insane amount of snow that has blanketed the east coast. Let me rephrase that- my husband has been snowed in due to the snow. He's been home since the storms (yes, plural) started last Friday. I, on the other hand, have a 4-wheel drive SUV (don't judge me) and work at a place that scoffs at the notion of blizzard-like conditions. This is me last Saturday. We got over 3 feet of snow total this week. While dear hubby was at home bemoaning the woes of acute cabin fever, I was traversing the land risking life and limb to bring home the bacon. I am a Nutritionist. I actually like my job and am very appreciative to have employment right now. However, I am not an essential employee- I'm pretty sure folks will survive The Blizzard of 2010 without their Nutritionist telling them to not eat yellow snow. Again, I'm very thankful for my job. However, I would have loved to have had a week off to work on my projects. I have a whole heck of a lot of ideas to get out of my head and fleshed out into yarn-y goodness or actually onto paper and not a whole lot of time to do it in. 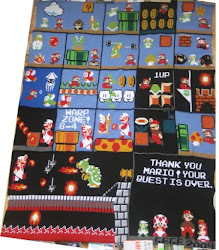 I've been promising some patterns for months now and am ashamed that I've not followed through in a timely manner. Sure, I have provided some free patterns (minus the Watermelon Hat pattern- seriously, it is coming! ), but the ones that I am going to offer for sale have to be tested and edited and otherwise prettified for public consumption. It's so easy to make one thing once- it's not so easy for me to write it down while I'm making it and then making it again to make sure I wrote it down correctly. HOWEVER. I am getting it done. 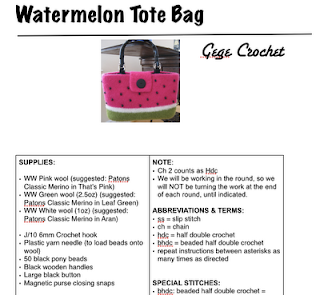 For example, I promised a while back that my Watermelon Tote Bag pattern was going to be posted. 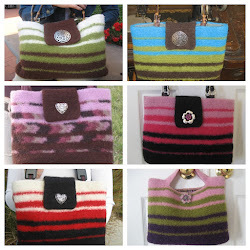 I worked on the second bag this summer so that I could write down the pattern. This is a pic of me at Summer Camp at the end of June working on it. See! New Years resolution WIN! I hope to have the pattern completed this week. I have a few more pictures to take and then off to Etsy it goes! Now, getting back to my opening line of "Today was a great day." You see, I really wanted to stay home today so that I could finish my pattern as well as work on the Turtle Bag pattern (I'm making the second bag now). However, my hubby truly was about to die from cabin fever (mainly because I was about to kill him for interrupting me the umpteenth time to tell me how bored he is). He wanted to go skiing or see a movie or go on a road trip or anything that got him out of the house. So, I, being the brilliant lass that I am, suggested driving to the nearest Hobby Lobby.....which is an hour and 20 minutes away. COMPROMISE WIN! While he did the driving (I did enough this past week, thank you very much), I was able to work on my Turtle Bag. Then, we got to do some retail therapy at one of the best stores in the world. I scored some yummy cotton yarn on clearance- win again! I then used said yarn to work on a bag concept I've had tumbling through my head for a while. Another win! We hit a couple other stores that were in the area (including a Joanns and AC Moore!) and then ate dinner at Carrabbas. So, I got to work on some crochet, bought some yarn and other crafty goodies, placated my hubby's need for freedom, AND had a date all in the same day! WIN WIN WIN! Hey Vancouver- where's my gold medal? 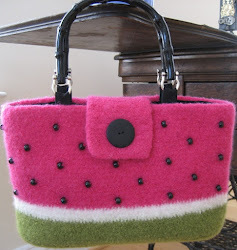 Congratulations on your watermellon bag pattern.